Often referred to as Vertical Form Fill and Seal machines - Vertical because the product being filled into the bag enters the bag vertically, Form because the bagging machine forms a bag from a reel of film, Fill because the bagging machine is coupled with other equipment (such as - multihead weigher, linear weigher, volumetric cup device, powder auger, liquid filling device) which is used to fill the bag, Seal because the bagging machine seals the bag to prevent any product spilling or leaking from it. These bagging machines can be intermittent or continuous motion - Intermittent motion machines are generally slower than continuous motion machines. The maximum running speed is dictated by the filling speed which usually depends on gravity - 9.8m/sec being the maximum speed of the product. For this reason the speed of the bagging machine is dependant on the weight and characteristics of the product to be filled into the bag. 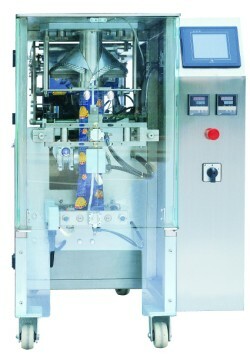 Usually the lower the weight of product the faster the bagging machine can operate. To select the correct bagging machine for your product and desired bag weight it is important to consider all of these factors. 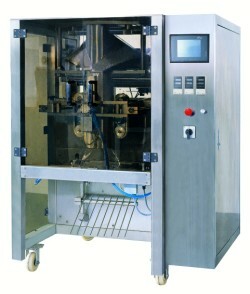 An expensive high speed bagging machine may only achieve speeds equivalent to a slower intermittent bagging machine due to the nature of the product being bagged. This could result in uneccessary Capital Expenditure for no improvement in efficiency. Often referred to as Flow wrappers - These machines are fed horizontally with the product being pushed mechanically into the package. The machine forms the bag from a roll of film in the same way as a vertical bagging machine but can operate at much higher speeds as it does not rely on gravity. These machines generally pack single items into a bag although many feed systems have been developed to feed multiple items into bags.